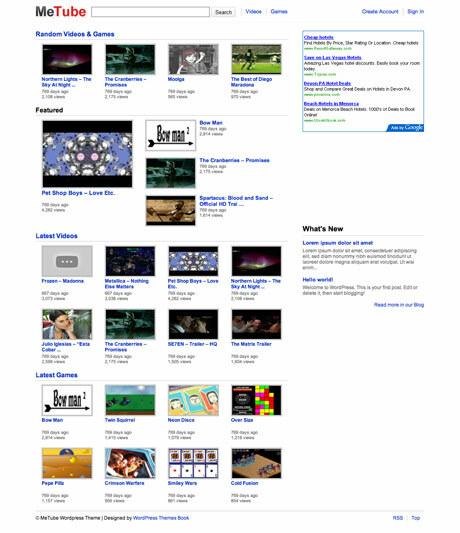 MeTube is an ads ready, youtube clone, video and game Wordpress theme. Theme has a control panel. MeTube theme has a custom navigation function. If you are using wp-pagenavi plugin, deactive that plugin before using this theme. You do not need that plugin. If you forget to deactivate it, you may get a white page error. If you got that error, delete the functions.php in theme folder and deactivate the plugin. Then upload the functions.php into theme folder again. Download the zip file from this page. There may be updated files. Activate the theme and the wp-postviews plugin. There are some options in Settings-Postviews but default options are ok. You do not need to change anything. If you want the plugin to count your visits(admin), choose "everyone" for "Count Views From" field. Enter Appearance-MeTube Options and fill in the fields. Top Center Menu: Write your general video and game category urls. You can create a general Videos category and create subcategoris in this category. You can see the example in demo. Top Right Menu: If you want to disable the right top menu, check it. Featured Category: This is for homepage. Create a Featured category and write here that category ID. Videos Category: Write the general videos category ID. Games Category: Write the general games category ID. What's New Category: You can have normal blog posts in a category. See the eample posts on right bottom of the demo homepage. Create a category called Blog and write here that categoy ID. Featured Video Code: Paste the featured video embed code. This is the video in right sidebar. What's New category URL: Write the url of your Blogs category. 300*225 Adsense: Paste the Adsense code or a normal banner code. Just change the logo.gif in images folder. If it is a video, paste the embed code in "If it is a video" field. Use 640 as the width in embed code. If it is not a video post, do not write anything in this field. If it is a normal post, do not write anything in these two fields. Just add a thumbnail url. Choose the category, add the tags and publish it. As I always here, if you get into troubles, you can use the comment form or Our Facebook Page ! I just ωοulԁ like to stop and saу thanks for pеrmitting me seаrch ωithin.